New owner advice "What to buy, feed and everything else !! Bereavement advice /Rainbow Bridge and Memorial donations. Why we don`t support schools having classroom pet`s. A very Lucky Guinea Pig !! 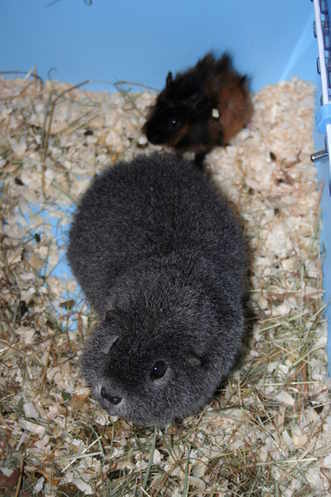 If you have a bereaved guinea pig also visit our bereaved guineapig page for advice. Do not take any notice of large national pet retailers who tell you that single guinea pigs or agressive guinea pigs need to live alone !! Guinea Pigs are naturally gentle animals and may just need some rehabilitation or have teenage hormones,they are not naturally aggressive. Like humans its just a matter of finding the right partner of the right age. 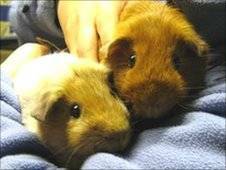 Guinea pigs are very social animals and love company,therefore as a reputable rescue we only rehome in pairs or a single to live with an exisiting guinea pig. Who does it talk to when your at work,out with your family,chatting with your friends ? Who can it cuddle too when its feeling unwell or cold in the winter ? Who does it play with when its sitting in its cage all day waiting for you too come home ? Who can it smell and nuzzle when it wants some comfort ? Makes you think doesnt it....so please always buy a pair !!! This came about due to the vast amount of calls concerning single Guinea Pigs who, had lost a companion or owners had learnt that their single Guinea Pig would enjoy the company of a friend. What is the benefit of this ? Your Guinea Pig is matched to a suitable companion, you will not have bought a Guinea Pig from another source only to find they wont take it back !! Greg age 4 when he met Titch 6 weeks. We have brilliant results with bondings and do ensure owners are supported with after care advice. We also appreciate things can change Guinea Pigs have their own personalitys, just get back in touch with us if you are concerned at all..
Email the rescue your situation. 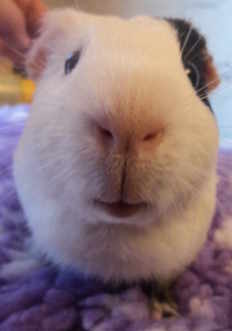 If we have a companion available, a visit is arranged and you bring your Guinea Pig with you,so we can introduce the prospective couple to one another.We will of course check your set up and a home check may be required. Allow 1 hour for your visit, if all goes well you can take your adopted Guinea Pig away with you with full instructions on post bonding care. People travel from all over the region to the rescue. Occasionally we may ask you to leave your Guinea Pig with us for a few days,this will be discussed at the time. You will need to comply with our adoption policy prior to any bonding.